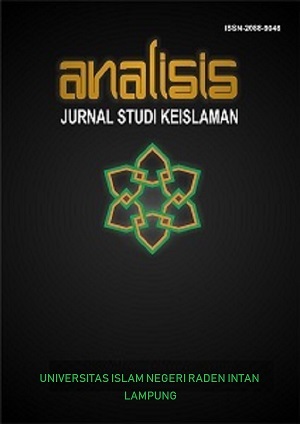 Analisis: Jurnal Studi Keislaman is an academic journal published twice a year (June and December) by Universitas Islam Negeri Raden Intan Lampung. The journal focuses on Islamic studies and communicates studies of the actual problems related to Islamic studies. Analisis emphasizes the specifications in the presentation of Islam and contemporary issues in terms of various aspects and approaches of Islamic studies. Editors invite academics, experts, and enthusiasts to contribute to the field of Islamic studies submit scientific articles on this research, reflection and serious study.